Visit http://52.40.136.168/calendar/ to find a gear hour that fits your schedule. Bring a check, cashiers check or credit card and a valid Cal student ID or a driver’s license. Fill out a rental form with the help of the presiding gear officer. Bring your gear back within two weeks, and reclaim your check or credit card info. You have two weeks to return your gear, starting the day you check out the gear and ending on the future gear hour closest to, but no sooner than, the two-week mark. You can also return at any earlier gear hour if you have already used the gear for its intended trip(s). However, please return the gear as soon as possible — we have a lot of people who need to use the gear! After 4 weeks, we consider the gear lost, and cash your check and use it to replace the gear. If a gear officer flakes on the hour you showed up to, then we extend your checkout by a week for free. You are responsible for notifying us if you have broken, lost, or damaged any of our gear. If you do, you will only be charged the price of having the particular item(s) fixed or replaced. Normal wear and tear is not charged for, but you must notify us nonetheless. If you do not indicate any such issues, and we find out some other way, you will be charged a $40 fine in addition to the price of fixing the gear. You are responsible for inspecting the gear before your trip for any damage or missing pieces. If you find any such flaw and notify us of it within two days of renting the gear (or before you embark on your trip, whichever is sooner), the previous renter of the item(s) will be held responsible. Otherwise, you will be held responsible. You should aim to return your gear in at least as good condition as when you first rented it out. For example, if your sleeping bag is still wet from rain, snow, or dew, please take the time to dry it out before returning it. If your gear is returned late because you took the extra time to clean or repair it in some way, you will not be penalized. Please dust/dry off any tents before rolling them up and bagging them, and try to roll/fold them in a manner similar to when you unrolled/folded them. Often folding into thirds does the trick, if you’re having trouble fitting the tent into its bag. Please hang your tent to dry if wet from dew or rain before returning, and keep track of any stakes that came with the tent. If your sleeping bag came with both a stuff sack and a compression sack, please put both the bag and its compression sack into the stuff sack upon return. The stuff sack is meant for long-term storage, and the compression sack for use on the trail. Please hang your sleeping bag to dry if wet from dew or rain before returning. Please clean your cookware properly before you return it! Please remove all food and trash before returning your bear cans, and clean/disinfect the inside if necessary. Please go through every pocket of your pack and make sure you’ve removed all of your belongings. For liquid fuel stoves, please see the below video for operation instructions. We have beacons, probes, and snow shovels available to rent, but they will do you little good if you don’t know how to use them! Before embarking on any trip with avalanche danger, please make sure you have read/watched the links below thoroughly and practiced the techniques they describe in low-risk situations. We carry two kinds of beacons in the shed, but all beacons are compatible since they use the same frequency to communicate. Gear is first-come-first-serve, you may not reserve gear. Just show up to a gear hour and see what we’ve got. DISCLAIMER: We reserve the right to reserve gear only for CHAOS-official trips (i.e. large trips posted to our email list, led by CHAOS officers, that occur every semester as a club tradition). What if I don’t possess a Cal student ID or a driver’s license? If you lack these forms of ID, any other–some college ID, work ID, California ID, etc.–will suffice. What if I don’t have a checkbook? Good news! We now accept credit and debit card numbers in lieu of a check. This can be permitted, but it depends on how much gear you want to use, and for how long past the normal two weeks. Talk to or email a gear officer about your circumstances. I plan on returning/have returned my gear on time, with the exception of items A, B, etc., which I would like to use for X more time. Is this permitted? Yes, but it depends on how many items you want to retain, and for how much longer. Talk to or email a gear officer about your circumstances. I would like to rent gear for X number of friends, including myself. How much gear can I rent under my name? 1 member: up to 1 two or three-person tent, 2 sleeping bags and pads, 1 stove, 1-2 bear cans, etc. 2 members: up to 1 four-person tent or 2 two-person tents, 4 sleeping bags and pads, 2 stoves, 2-3 bear cans, etc. Per this rule, if your group contains, say, four CHAOS members, you may not rent out more than eight-persons’ worth of tent space. This rule does not, however, place a restriction on how much gear any one member in that group of four can list on his/her particular gear form (so only one CHAOS member in the group needs to make the rental if the gear hour is hard to make for the rest of the group)–it simply bases the total amount of gear on the total membership of the group. The $10 membership fee is good for a full year, beginning on the day you become a member. 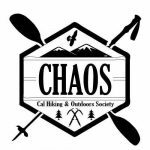 How can I become a member of CHAOS in order to check out gear? The membership fee is $10, which can be paid at the regular CHAOS meeting or at the gearshed! How can I buy a CHAOS tshirt? Tshirts cost $15 normally, but are $10 if purchased with membership. You can buy them either at the weekly CHAOS meeting or at gear hours. I am not a member of CHAOS–can I rent out gear in the place of my friend who is a member? Yes, but you must be able to provide all the necessary information of your friend when you fill out the rental form in his/her place. And, of course, that friend must be coming on the trip with you. When I first checked out the gear I thought I could return it on time, but due to my circumstances, I don’t think I will be able to–will I be charged the late fee? Possibly–it depends on the circumstance and how much advance notice you give the officers of your situation. See if you can arrange for a friend to return the gear in your place, and make sure to keep us informed. I’m renting out gear under my name, but I won’t be available to return it on time. Can my friend return the gear for me? I’m unable to attend any of the listed gear hours before my trip begins. Is it still possible to rent any gear? Perhaps, but you must email the CHAOS officers at chaos-officers@lists.berkeley.edu ASAP to see if any of them can accommodate you at an off-schedule time. I showed up to a gear hour and no one is/was there? Sorry! Please email or call the gear officer who was supposed to be there (contact info is listed under gear hour event details on the calendar), or email the officer list. Your gear will not be counted towards any return/lateness deadline for that week. Yay! Please email the officer list! Books on climbing, hiking, etc.